British and French destroyers in formation. 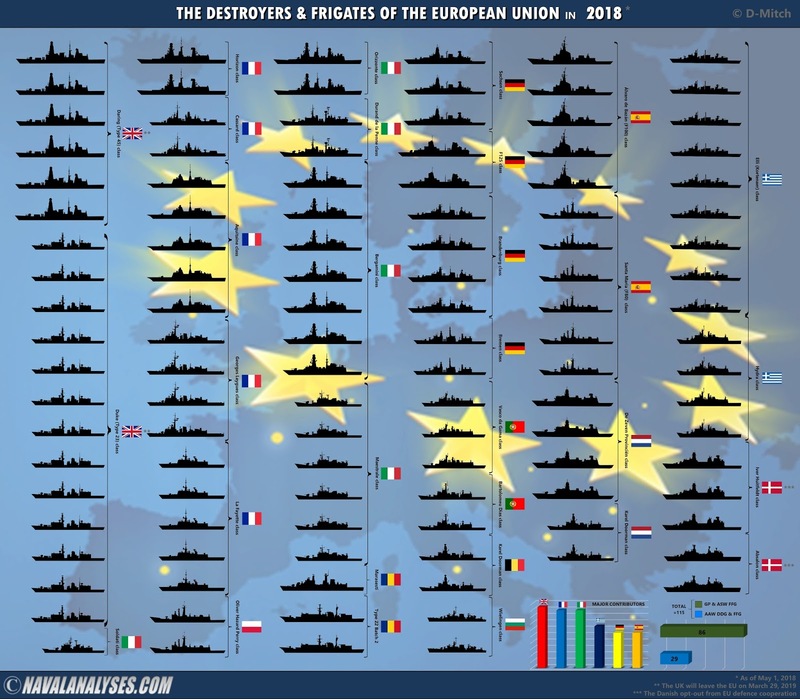 The following infographic depicts all The destroyers and frigates of the European Union in 2018, in a single image! Note though that the military forces of European Union are not integrated and thus there is not a single European Navy from the members of the European Union. However, in March 2017, the European Union approved a new military command center for foreign training missions after Britain dropped its opposition (which was the main obstacle), the latest step in EU efforts to integrate its military forces and defense industries.Therefore, the formation of a "EU Navy" is closer than ever. 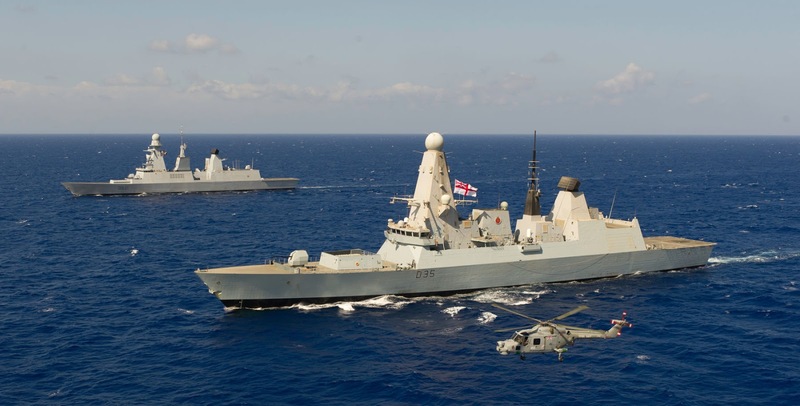 The EU major surface combatant fleet consists of 115 frigates and destroyers of which 29 are anti-aircraft warfare (AAW) warships and the rest 86 are general purpose (GP) and anti-submarine warfare (ASW) warships (SSBN)! There are 31 classes in commission (some of them are actually are variants of main classes such as the Karel Doorman or O.H. Perry). The major contributor to the EU naval fleet (till today at least) is the United Kingdom (UK) with 19 major surface combatants. France and Italy have just one less ship in their fleets, while Greece counts 13 ships with Spain and Germany 11 each. UK has six (6) AAW destroyers in commission, Spain five (5) and France and Italy four (4) each. Note that the Danish opt-out from EU defence cooperation and the UK will leave the EU on March 29, 2019. 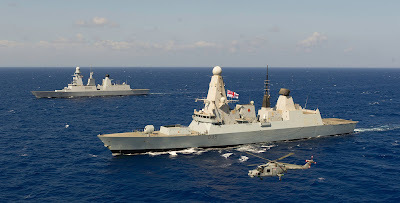 Moreover, countries such as Romania and Bulgaria have warships with limited armament; especially the two Type 22 frigates could be characterized as large offshore patrol vessels as they lack any missile system. The destroyers and frigates of the European Union in 2018. For a high resolution image click here.